Designed for long range precision shooting. Thanks to CNC precision machining the only slop in a Warne Extended Skelitonized 1" MSR Mount is the 20 MOA built in for accurate shooting at distances over 600 yards. Crafted of 6061 aluminum, the weight has been reduced by over 30% compared to other R.A.M.P. mounts thanks to the skelitonized body and ring caps. 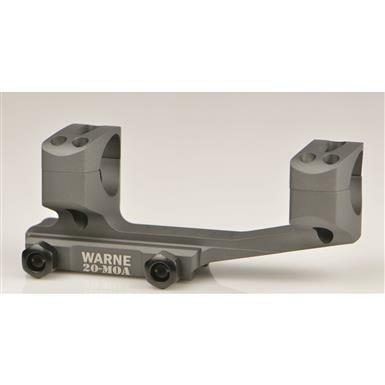 The Warne Extended Skelitonized MSR Mount also provides 2" of forward cantilever to provide additional eye relief when using scopes with large eye boxes. Magnify the effectiveness of your red dot sight.